From master storyteller, Guillermo del Toro, comes THE SHAPE OF WATER, an otherworldly fairy tale set against the backdrop of Cold War-era America circa 1962. In the hidden, high-security government laboratory where she works, lonely Elisa (Sally Hawkins) is trapped in a life of isolation. Elisa’s life is changed forever when she and co-worker Zelda (Octavia Spencer) discover a secret classified experiment. Rounding out the cast are Michael Shannon, Richard Jenkins, Michael Stuhlbarg and Doug Jones. 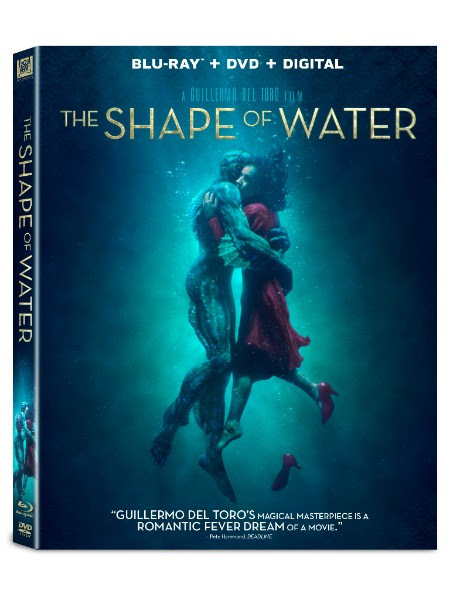 Add THE SHAPE OF WATER to your digital collection on Movies Anywhere beginning February 27 and on 4K Ultra HD, Blu-ray and DVD on March 13. Twentieth Century Fox Home Entertainment, LLC (TCFHE) is a recognized global industry leader and a subsidiary of Twentieth Century Fox Film. TCFHE is the worldwide marketing, sales and distribution company for all Fox film and television programming, acquisitions and original productions as well as all third party distribution partners on DVD, Blu-ray™, 4K Ultra HD, Digital and VOD (video-on-demand). Each year TCFHE introduces hundreds of new and newly enhanced products, which it services to retail outlets and digital stores throughout the world.